Sometimes I find myself in a bujo-rut. Most of the time I love my system and have worked hard to settle into it – but there are days I itch to try something new. I love the experimental nature of the bullet journal and sometimes we just don’t know about all the goodness that is out there! There is so much wisdom in the bujo community, so I’ve wrangled a few places I’ve searched for inspiration lately. Bullet Journal Junkies – This is the motherlode of all FB groups for Bullet Journal. Do NOT enter into this world unless you’ve done a lot of work on your own first – it is easily overwhelming since it is a highly active group. There are many off-shoots of this group, including Bullet Journal for students, SAHM, Mental Illness, SO MANY. Just do a search “bullet journal for…” and you’ll find them. Bullet Journal in a Traveler’s Notebook – I’m a huge Traveler’s Notebook fan, so this group is chock full of ideas on how to use the bullet journal inside this system, layouts, supplies, and more. Plus, Allycia is awesome. Bujo Pros – A Facebook Group dedicated to professionals everywhere – ideas for how to use the bullet journal for your profession. They are super useful if you’re looking for function over form! Lettering League – If you are learning lettering and want to find some inspiration and helpful folks, this group is awesome. 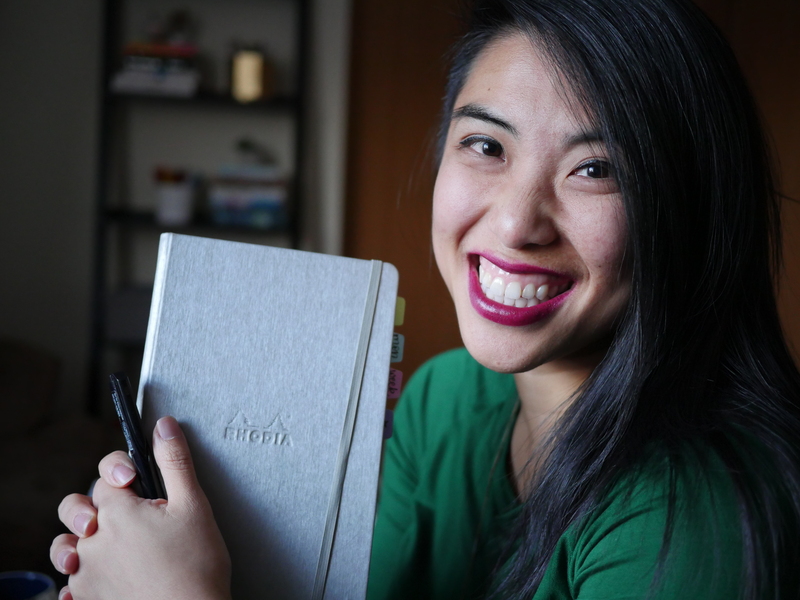 Bujo Pals – A huge list by Kim that helps you find some new faces to follow! Weekly Spread Ideas – the original post that inspired my first rendition of my weekly spread, ala Kim! 50 Collections for Your Bullet Journal – MJ brainstorms a HUGE list of ideas for lists in your bullet journal – if you’re a list maker, a recovering #ListersGottaList fan, this is perfect for you! Importance of White Space “When Less is More” – This one is a little different. I’m struck by how packed my days are, and this notion that the space around ideas and things create possibility. That a decluttered room feels peaceful, or a well-placed pause in a phrase makes you listen more deeply, like an empty book shelf. I am working on creating pauses between things like meetings, events, moments, and more. Everyone started somewhere. It’s too easy to be like, “Oh my stuff isn’t as _____ as theirs!” Or “I wish my pages looked like theirs!” Comparison is natural, human – but you can tell it to get out of the driver’s seat. Keep the inspiration as a launching point, another experiment, another progress point – and do what you want to in baby steps. You just haven’t seen the weeks, months, of effort and frustration and unused layouts and spreads (I have MANY of them) – so don’t forget the WHOLE picture. Credit. This is a huge debate – do you credit someone or not, every time, or enough times? But my thought is, if you know exactly who you got the layout from, you should credit that person. It’s frustrating if someone takes your exact style and layout as if it is their own – I’m not talking a similar ish structure (there are only so many weekly configurations, right) but if I take a really popular example, it’s impossible that hundreds of people just happened upon a style that looks exactly like Kara’s (boho.berry) with the time ladder, sunrise, sunset, color scheme, headers with the arrows, the same weather sketches, etc. There’s inspiration that you use as your own springboard, which is part of the creative process, and also acknowledging where it comes from when it’s appropriate. What works for someone else doesn’t mean it will work for you. The point of this system is that it evolves to YOUR needs. So, don’t feel bad if the Calendex, Index, signifiers, don’t work for you. Own the stuff that DOES. I struggled for a while thinking I HAD to use an index or a monthly calendar…. I had to let that ish go so I could really leverage what WAS working – the weekly layout. The energy used to refine that got me farther than being paralyzed by someone else’s well-earned system. Who are your bujo crushes right now?! Where else should I be inspired? I am getting ready to travel to some of the other links, but I agree with you about what works for one, doesn’t work for another. It’s really frustrating to see all the people out there who think their Bujo ‘isn’t good enough’, or isn’t pretty enough. It’s almost like it’s a decorating contest and not a method for organizing your life and getting through the day. Thank you so much Jessica for all these useful tips and links. Have been looking on my own but your ressources are really what I was looking for! Great links, very helpful and full of inspiration. Thanks for sharing. YES the original of originals! Can’t believe I forgot! Thank You for the valuable pointers! Those are especially helpful for those, like me, who are just in the beginning of bujo journey!